The ATS675 is the next generation of the Allegro® True Power-On State (TPOS) Sensor IC family, offering improved accuracy compared to prior generations. The ATS675 provides absolute zero-speed performance and TPOS information. 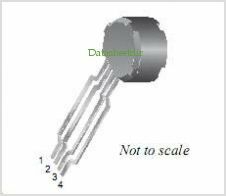 The device incorporates a single-element Hall IC with an optimized custom magnetic circuit that switches in response to magnetic signals created by a ferromagnetic target. The IC contains a sophisticated digital circuit designed to eliminate the detrimental effects of magnet and system offsets. Signal processing is used to provide device performance at zero target speed, independent of air gap, and which adapts dynamically to the typical operating conditions found in automotive applications, particularly camshaft-sensing applications. By Allegro MicroSystems, Inc. This is one package pinout of ATS675LSE,If you need more pinouts please download ATS675LSE's pdf datasheet. 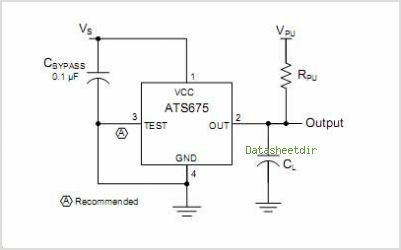 This is one application circuit of ATS675LSE,If you need more circuits,please download ATS675LSE's pdf datasheet.